Sullivan & Cromwell's Project Development and Finance Group offers clients unrivaled quality in connection with the development and financing of natural resources, energy and infrastructure projects. Unlike other firms working on a high volume of routine projects, at any one time, S&C is highly focused on a small number of the world's largest and most complex projects. The Group focuses on large projects with complex multisource finance plans. The average size of S&C's current financings is $2.9 billion and more than half have values of more than $500 million. The Group brings complex and challenging projects to a successful financial close in novel and unprecedented circumstances. S&C has a well-earned reputation for skill and innovation, forged during decades of work in emerging and developed markets. 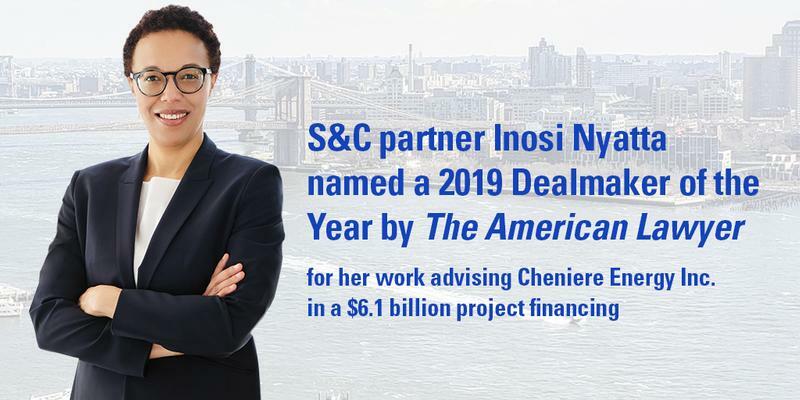 The Firm has shepherded many first-of-their-kind projects, mitigating and managing risk for sponsors and lenders even under difficult market and political conditions. Few firms boast project development and financing groups of S&C's depth and skill. With offices on four continents and in nine countries, S&C's deep bench of U.S.-, English- and French-law qualified lawyers work on integrated teams that are tailored to the specific needs of clients, regardless of locale. These integrated teams handle projects in Australia, Latin America, Europe, Asia, Africa, the Middle East and North America. In contrast to other firms, S&C handles a majority of its project finance work for borrowers and sponsors. The Firm prides itself on managing transactions proactively for its sponsor/borrower clients. Because most of S&C's project financings involve multiple sponsors, S&C understands the importance of addressing the separate commercial concerns and economic objectives of each sponsor within the consortium. The consequence: S&C has the leading sponsor/borrower practice in the world. The Firm deftly coordinates multiple financing sources, including commercial banks, export credit agencies and project bonds. S&C possesses up-to-the-minute knowledge regarding the approach and requirements of each potential lending source—market insight that proves invaluable to any project.